The new measures criminalize the publication of “unreliable socially significant information” – in other words, anything the authoritarian government decides is “fake news” – and also makes it a crime to “disrespect” public officials, most definitely including Putin himself. Under the bills Putin signed into law, publishing fake news can bring fines of up to $23,000 in U.S. currency, while showing “clear disrespect for society, the state, the official state symbols of the Russian Federation, the Constitution of the Russian Federation, and bodies exercising state power” can fetch $4,700 in fines plus 15 days in jail. Previous Russian legislation made significant impositions on Internet companies, such as forcing search engines to comply with government censorship demands and social media apps to decrypt private communications upon request by Russian security agencies. The new laws represent significant steps by Putin toward Chinese-style control of speech content and chilling dissent. Russian Internet users will doubtless think twice about saying anything that could bring heavy fines crashing down upon their heads. “This sphere – the sphere of fake news – insults and so on, is under strict regulation in many countries of the world, even in European states. This undoubtedly has to be done in our country,” Kremlin spokesman Dmitry Peskov said last week. Peskov’s defense of the new laws should give Europeans, Americans, and the rest of the free world pause, because he’s not entirely wrong. The Internet is sinking toward the lowest common denominator of free speech, a kind of censorship arms race. Speech controls are justified everywhere as vital to social harmony. Where governments do not enforce censorship, Big Tech companies do it themselves, neatly avoiding American constitutional concerns about government suppression of free speech. Authoritarianism is infectious, as Western tech companies grow accustomed to complying with censorship demands from Russia, China, and other authoritarian states. The Russian people held impressive rallies against Internet censorship in March, fearing Putin will create an isolated “Russian internet” comparable to what China accomplished with its Great Firewall. Protesters pointed out that Russia’s authoritarian government has already stifled most other forms of expression and Russians have already gone to jail for writing Tweets. The new censorship bills give even more speech control to a government that already punishes dissent. The protests were accompanied by hacker attacks intended to demonstrate the Russian Internet censorship system is vulnerable to abuse. On the other hand, recent polls showed a majority of Russians believe Internet censorship is necessary. One poll found only 25 percent of Russians were firmly opposed to it. 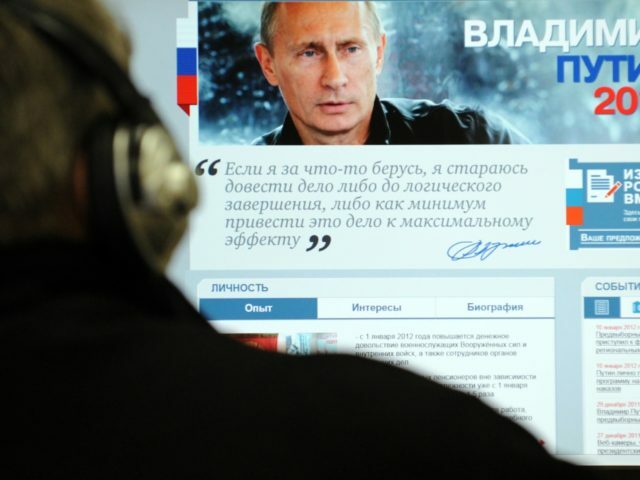 Russia’s state-controlled broadcast media scored considerably higher on trust than the Internet. Doubtless many of these poll respondents believe Putin’s new censorship laws will make the Internet more like state television, radio, and newspapers. As with all others who agree to censorship in the interest of social harmony, Russians will soon discover that terms like “unreliable information” and “disrespect” for the government are highly elastic. They can be redefined to censor anything the government wishes to silence, anything that would threaten the enforced “stability” of society. China’s vast and terrible censorship machine was largely sold as a crusade against fake news in its early days, an effort to purify the Internet experience by protecting citizens against propaganda, manipulation, and obscenity. It’s not easy to find anyone with power and influence in the world today fighting for greater freedom of speech. The question asked in legislatures – and corporate boardrooms – is how much freedom should be sacrificed in the name of harmony.